Pokémon TCG: Sun & Moon is the latest expansion to the Pokémon Trading Card Game franchise. In this expansion, players will receive a warm welcome to the tropical Alola region and start their journey with Rowlet, Litten, and Popplio. 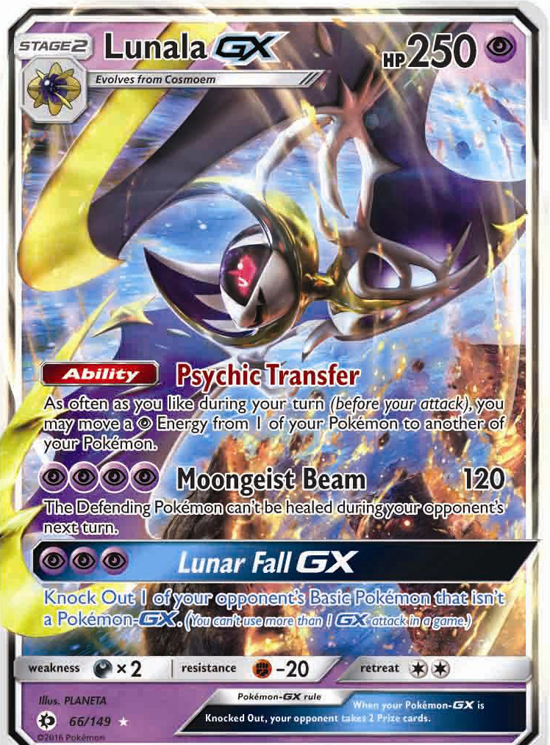 They then have the chance to seek out the Legendary Pokémon Solgaleo-GX and Lunala-GX to witness the awesome power of a new kind of Pokémon: each Pokémon-GX brings an attack so devastating that you can use only one of them per game! Discover dozens of never-before-seen Pokémon, Alola forms of some familiar favorites, and new ways to battle in the Pokémon TCG: Sun & Moon expansion! More than 40 brand-new Pokémon: Many of the exotic and tropical Pokémon that Trainers have come to love in the new Pokémon Sun and Pokémon Moon video games join the Pokémon Trading Card Game in this expansion! New Alolan Pokémon: Regional variants of many classic Pokémon who have a new look in Alola will appear in the Pokémon TCG. Many of these Alolan Pokémon have a free attack, one they can use with no Energy attached! Introducing Pokémon-GX: These super-powered Pokémon will have a huge impact on the game. 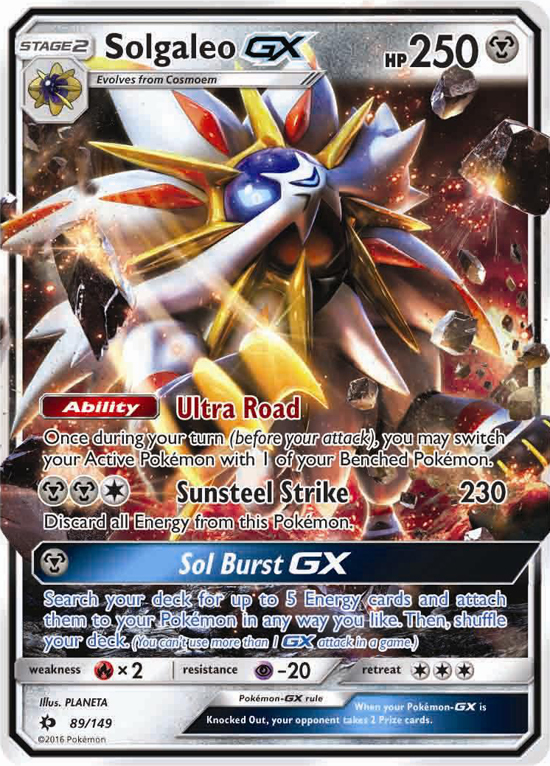 Legendary Pokémon: Solgaleo and Lunala, the Legendary Pokémon from the Pokémon Sun and Pokémon Moon video games, join the Pokémon TCG as new Pokémon-GX. New card design: The beauty of the Alola region is reflected in the new art and design of the Pokémon TCG: Sun & Moon expansion. Booster packs: Packs of 10 additional cards selected from the expansion will be available. Three new theme decks: These 60-card preconstructed decks are designed to introduce players to the Pokémon TCG by enabling them to play right away. Sun & Moon theme decks and booster packs include an in-pack code card that unlocks virtual cards from the Sun & Moon expansion for play in the Pokémon Trading Card Game Online at www.pokemon.com/tcgo.